Wise democracy is more a vision to be pursued than a goal to be achieved. We can work towards a vision of a “wise” democracy just as we can work towards a vision of a “just” society. We may never arrive at absolute wisdom or total justice, but striving towards such inspiring visions helps us build progressively “wiser” democracies and “more just” societies. Here are four overall guidelines to help us envision and pursue a wise democracy. Every pattern in this pattern language is intended to help us follow one or more of these guidelines. Avoid doing things that would naturally tend to generate collective stupidity and folly over the long haul. Use everything that could help us generate potent collective intelligence, wisdom and broad benefit over the long haul. Take collective action guided by what we learn as we seek to apply these principles. Learn from reality about the wisdom of our actions, using ongoing openness, deliberative attention, and repeated examination of results. Reality will reveal any important overlooked factors and offer new insights and possibilities. These may seem obvious and overly general, but there’s much we can and need to know about how to do each one of them. That’s what this pattern language is about – learning how to do the four things above, as groups, communities, and whole societies and civilizations. There is an additional way to make sense of wise democracy and the diversity of patterns offered on this site to help us develop it. The Venn diagram linked on this page depicts overlapping circles representing Power, Participation, and Wisdom. 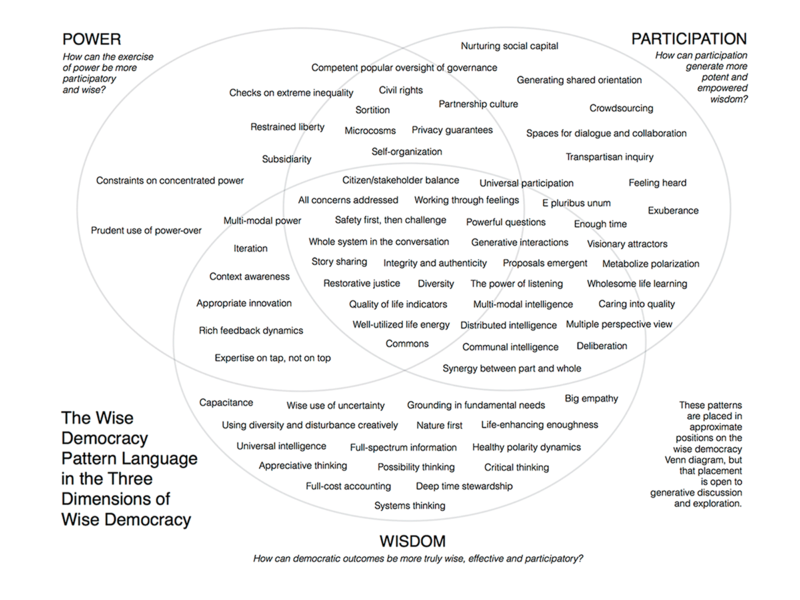 These factors – these three dimensions of wise democracy – don’t overlap much today, but the wise democracy vision calls on us to develop their areas of overlap. 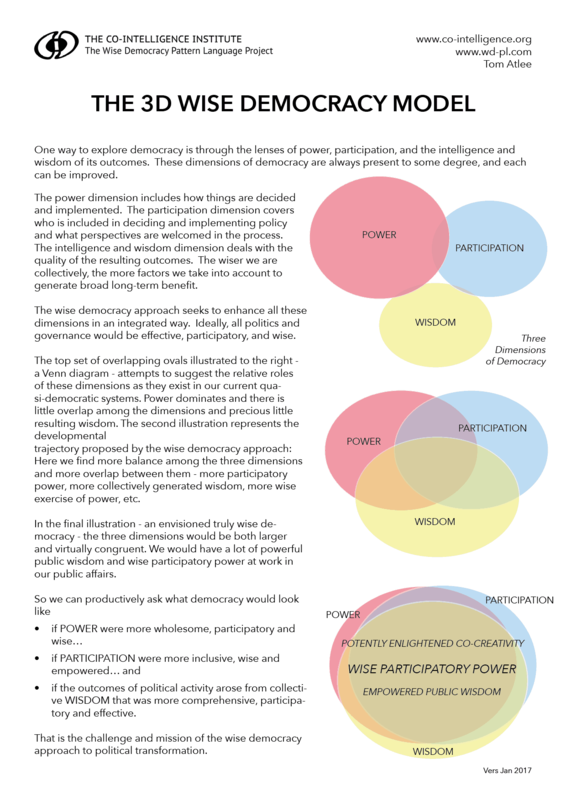 Ultimately we can envision a time when most power is participatory and wise, most participation is wise and powerful, and we flourish in an abundance of participatory wisdom generating powerful, long-term, broad benefits in the world. So this Venn diagram has a visionary function, inviting us to imagine how power, participation and wisdom evolve to become manifestations of the same thing. A concise presentation of that process can be found in “The Wise Democracy Model – a Brief Portrayal” in the column to the left. A more detailed description can be found HERE. The Venn diagram also provides a framework within which to place the wise democracy patterns in relation to each other and to power, participation, and wisdom. That map is represented in the “Patterns in the Venn Diagram” graphic at the top of the left column and more fully detailed in its pdf download HERE. We have distributed the initial patterns in areas of the Venn diagram that seem appropriate. However, these placements are intended to be provocative and evocative, not conclusive. There are valid arguments for placing a given pattern in a different spot. I hope their current arrangement will feed our inquiry and perhaps inspire new patterns that will fill out some of the less populated areas of the diagram.